Have you ever wanted to learn how to trade the bullish piercing candlestick pattern? If so, then you’re in luck. In this addition to my price action course, I’m going to show you how to identify and trade the bullish piercing pattern. 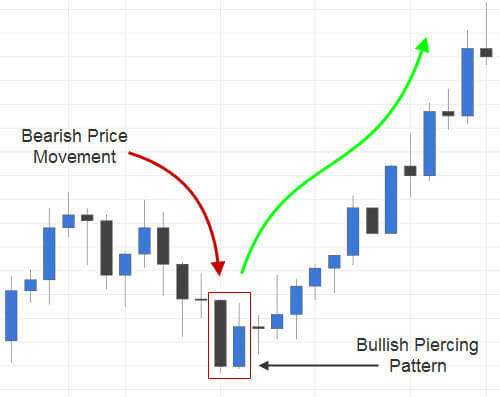 This pattern is considered to be a moderately strong reversal signal – not in the same strength category as, for instance, a pinbar (shooting star or hammer) or an engulfing pattern. Since this signal is only moderately strong, price often will retest the low formed by the bullish piercing pattern. Consequently, many traders become discouraged, trading this pattern, before they get a feel for it, or understand how this pattern can really benefit their trading. 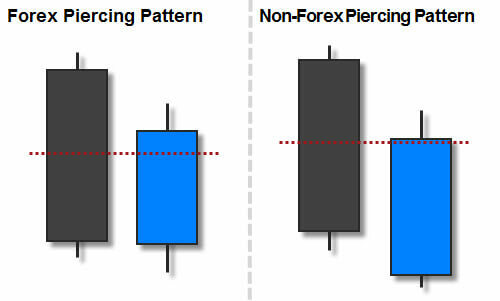 What is a Bullish Piercing Candlestick Pattern? The bullish piercing candlestick pattern is, obviously, a bullish signal. It is also a moderately strong reversal signal, as I mentioned earlier. Like most of these candlestick patterns, the context in which this pattern occurs is very important. A true bullish piercing pattern only occurs after a downward trend in price. This pattern consists of a relatively large bearish candlestick, followed by a bullish candlestick that closes somewhere above the 50% mark of the preceding candlestick’s real body (see image below). In Forex, the bullish candle should open near the close of the preceding bearish candle; there are rarely gaps in Forex, because of the extreme liquidity of the market. In other markets, the bullish candle should open below the preceding bearish candle (as seen above under Non-Forex Piercing Pattern). In the image below, you will see a bullish piercing candlestick pattern followed by a nice rally in price. This bullish piercing pattern was preceded by a bearish (downward) price movement, which is a requirement to qualify taking this trade; the context is very important whenever you’re doing any kind of price action trading. The doji could be a signal that the bears are running out of steam, but price continued to drop. The next candle was another bearish candlestick, which had a real body that was bigger than the previous 10 or so candlesticks. The idea is that this larger candlestick is more significant, and so are any patterns that develop from it. In order to make a bullish piercing pattern, the next candle must close somewhere above the halfway mark of the preceding bearish candle’s real body, which our example below does (barely). If you would have taken this trade, you could have made some significant gains. Since the bullish piercing candlestick pattern is only a moderately strong reversal signal, it would have been nice to see some western technical analysis supporting this trade. Note: Steve Nison recommends combining Japanese candlestick trading with your favorite western technical indicators. A good trend and reversal trading system can be very useful for trades like this one, and for further qualifying price action trades in general. Example: The Top Dog Trading system measures multiple market energies and combines that with certain triggers for taking trades. These candlestick patterns can take the place of those triggers, or at the very least, the Top Dog Trading system would have likely shown several market energies that supported taking the trade in our example above. I personally do not take any bullish piercing candlestick patterns as entry triggers without some kind of confirmation from my main trading system. As opposed to the stronger signals, e.g., engulfing patterns, morning/evening stars, pinbars, etc., which I sometimes make exceptions for. Maybe you prefer to trade pure price action, or perhaps all of the signals are lining up in your trading system; either way, the piercing pattern above could have been profitable for any trader that spotted it. 1. You could enter the trade when and if the new candle (the candle after the bullish piercing pattern) breaks the high of the previous candle. 2. You could take this trade on the open of the new candle. 3. You could wait for the new candle to possibly pull back in price to 50% of the piercing pattern’s bearish candle (real body) before entering. 4. You could wait and possibly enter when and if price retests the support level revealed by the bullish piercing pattern’s formation. Simply place your stop loss under the lowest low in the sequence of the piercing pattern. In the example above our stop loss would have been placed under the low of the bearish candlestick in the sequence. Trading Japanese candlestick patterns doesn’t always work out as nicely as the one in the example above did. Sometimes you lose on multiple signals in a row, which is why managing your money correctly is so important in any trading that you do. Having the patience to take only qualified trades while risking consistent, responsible amounts of money on each trade will go a long way toward your continued success in trading candlestick signals. It’s more profitable to trade Japanese candlestick patterns with western technical indicators. If you’re already using a profitable trading system that takes advantage of these indicators, you will be much more likely to benefit from trading Japanese candlesticks as entry signals. Pure price action trading can still be profitable, but I would personally not recommend the bullish piercing pattern for that style of trading. If you really prefer naked price action trading, I would recommend sticking to the stronger reversal signals. As always, the context in which these trades are taken is very important. A true bullish piercing pattern only comes after a bearish trend in price. This movement in price, however, can contain as few as three significant, consecutive, bearish candlesticks in order to qualify as a bearish trend. Never carelessly risk your hard earned money. Be sure to demo trade each new candlestick pattern that you learn until you are confident in your candlestick trading techniques. As with any type of trading, proper money management and patience will go a long way toward your success with these candlestick strategies. Add some quality, practice screen time, and you could be trading the bullish piercing candlestick pattern like a pro in no time.